When I was a boy I watched a story called “Groenie die draakie ek wil brandweerman word”, a 1970’s cartoon about a little dragon that wants to be a firefighter. The next morning, we were walking down Main Street in Greytown, shopping for clothes. In my walking, I passed the Fire Chief (Direction of Protection Services) of Greytown, GJ Naude. I turned around and followed him. He stopped, and I asked him if he could help me to become a fireman. As it was late on Friday afternoon, he said I should come to the office on Monday afternoon. That was the longest weekend in my life, Monday morning School made it even longer. That Monday afternoon I walked over to the Fire Station. One of the fireman left the service, so I ended up getting a helmet and jacket. They were small but looked large on me. I also got size 10 leader boots, a belt and a fireman axe. My shoe size was 8, so I had to were 2 pair of shocks and put newspaper in front to make them fit. I left his office and he told me to be back at 18:00 to see what they do. I was there at 17:30. The CFO introduced me, the first drill was done, so I asked to join the parade. I have never looked back. I feel the same today as I did then, only much older. The CFO wrote letter to the principal of my school, Mr. Odendal, asking that I be exempted from all school sports and if they could use me if they needed to. I replaced the fireman who left and started as a shift worker; 7 days on 7 days off for the next four years. My shift activities started at 14:00 and ended at 24:00. My duties included: pump operator, firefighting, Civil Defence Shift Leader, training of Civil Defence Fire Fighters, Training Pioneer Volunteer Fire Fighters, and fire prevention training for Council employees. The fire station became my home. 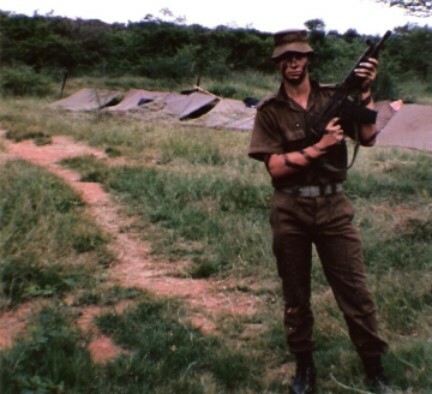 In those days, the CFO gave classes for South African Emergency Services Institute. I joined in on lectures and when exam time came, I was given an exam for a junior fireman. The exam paper was seen to be equal to STD 9 (Grade 11). Nobody expected me to pass, but pass I did. They then realized that I was only 13 and not 14. You had to be 14 years to be Civil Defence, so I became a member of SAESI in 1985, that year my certificate was issued to me. Passing the exam at 13 was such an achievement that I made the newspaper. In those days the mayor gave the certificates out, but our mayor was out of town, so the deputy mayor awarded me my certificate. In 1988 I received call up papers to the Air Force. I did not want to lose any fire experience, so when found out that I could join the Air Force as a member of the fire brigade, I was glad I would be able to live my dream. 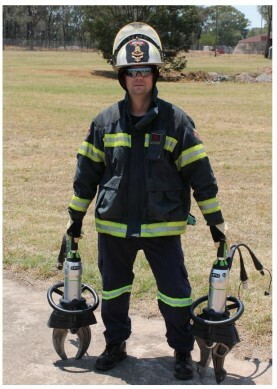 With the help of the CFO and my parents, I applied as an Air Force Fireman. They asked me to come to Pretoria for the interview. They were very happy with my Junior Fireman certificate and 4 years as fireman. The showed me that I qualified as corporal. As it was never done before for some finishing matric, to my knowledge, they said this would cause big problems, but they would make me a Lance Corporal and after a year make me a corporal. In your first year as a beginner in the Air Force, you were known as a “roof” (Airman). Having rank, I became a “roof Aral”. In 1989 I completed basic (I celebrated my 18 birthday in basic; not so nice to have your birthday in basic). 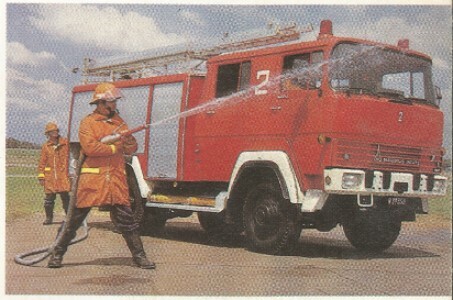 After basic I was assigned to Dunnottar Fire Training School in Transvaal Province (now Gauteng). After completing the school I went back to Greytown where I completed a code 11 driver license on a 22 ton payload Mercedes Benz truck. I volunteered to go to Hoedspruit to further my career and wrote my Fireman exam. A year later I became a corporal and the next year a sergeant. This made me the youngest sergeant in the Air Force Fire Brigade. To my knowledge I was youngest in the Air Force. In 1991 I completed my Basic Ambulance Course at Cape Town. In 1992 I had wonderful experience with God. I prayed to return to Pretoria. Within 2 days of my prayer I was transferred to Waterkloof Air Force Base. Through the then Captain, van der Weshuizen, we wrote a letter to the General requesting permission for me to volunteer at Centurion Fire Department. It was approved. I learned all 14 vehicles and the control room during my volunteer sessions. From January 1989 to May 1993 I was a firefighter in the Air Force. I was stationed at Hoedspruit from 1989 to 1992 and Waterkloof from 1992 to 1993 as a shift supervisor. My duties as supervisor included aerodrome (military airport) procedures. 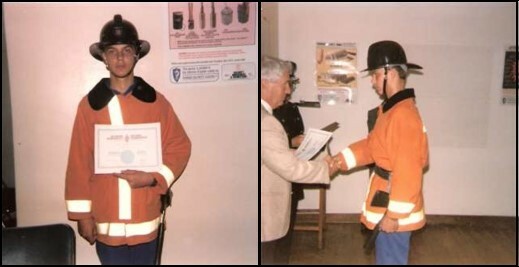 From 1991 to 1993 my duties included quality management controller, fire fighting, rescue operations, fire prevention, fire fighter supervisor and shift training officer. In 1993 I applied for a position at Centurion and was hired. In 1997 I completed Ambulance Emergency Assistant (this is an Intermediate Life Support (ILS) certification, and generally close to the same scope of the US EMT-I). In 1998 I met my beautiful wife Ronel, and she challenged me to further my education. In 1999 I completed a higher certificate and started Bachelors of Technology (B-Tech) program at Tshwane University of Technology. I received my B-Tech degree in 2004. From 2000-2006 I was the acting officer and when the re-structure of the City of Tshwane Fire Brigade was approved I became the officer. In 2015 I received my 30-year award from the South African Emergency Services Institute at the conference in Johannesburg. I am the youngest person to ever receive the award. Today I serve as the Company Commander in the north-east of Pretoria at Wonderboom Magalies Fire Station.